CFSA Associate director Mr. Zhutian Wang met Mrs. Maria Pilar Aguar Fernandez Head of Unit for Chemical Assessment and T.. The 47th Codex Committee on Food Additives (CCFA) conference was held in Xi’an from March 23rd to 27th 2015. More than.. 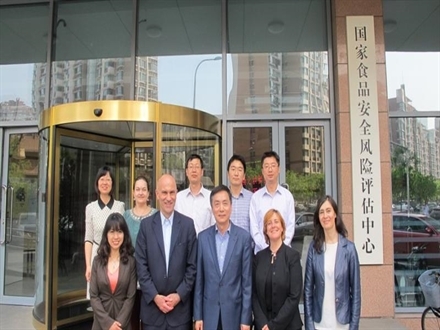 The National Food Safety Standard Review Committee’s (SNSRC) 11th director conference was held in Beijing on February 11th, ..
CFSA Associate director Mr. Zhutian Wang met Mrs. Maria Pilar Aguar Fernandez Head of Unit for Chemical Assessment and Test of JRC and other representatives from JRC on 23rd April 2015.CFSA and JRC respectively introduced each organization structure. They made a further discussion on the responsibilities, challenges and development in fields of.. 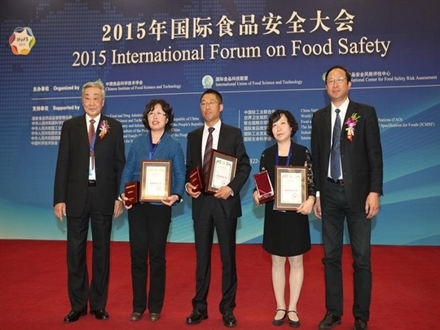 The 47th Codex Committee on Food Additives (CCFA) conference was held in Xi’an from March 23rd to 27th 2015. More than 260 representatives from 51 countries and 1 organization (EU) have attended the conference. The conference was held by CFSA and it was the ninth time that CCFA conference was presided in China. CFSA’s chief advisor an.. The National Food Safety Standard Review Committee’s (SNSRC) 11th director conference was held in Beijing on February 11th, 2015. The director general of National Health And Family Planning Commission (NHFPC) Mrs. Bin Li attended and made a speech at the conference. NHFPC deputy director and SNSRC vice chairman Mrs. Xiaotao Jin hosted the c.. The 12th National Nutritional Science Conference was held in Beijing at the national convention center on from May 16th to 18th, 2015. More than 2000 representatives from fields of nutrition, food science and agricultural attended the conference and shared research progress in the nutrition field. This conference consisted of 39 special seminar..
To summarize standard integration work of 2014, deploy and implement 2015 missions, the “food safety national standard integration” interim work conference was held in Beijing. The food safety standards, risk surveillance and assessment department of National Health and Family Planning Commission (NHFPC) directed the meeting and assigned CFSA to ho.. Experts of China, the United States of America, and the European Union Exchanged on Expe.. 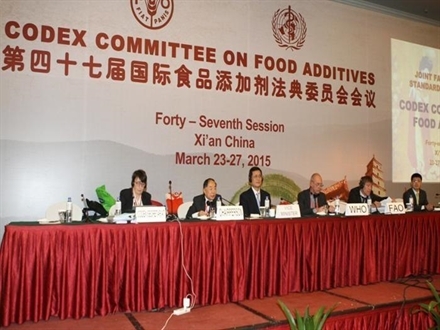 The 47th session of Codex Committee on Food Additives was held from March 23rd to 27th, 2015 in Xi’an, China. The meeting has attracted experts in the field of manufacturing and management of food additives and stakeholders in the food industry from all over the world, gaining broad support and attention world widely.After the first day..
To improve the performance of the national food safety risk monitoring reference, CFSA held the national food safety risk monitoring reference lab seminar from May 6th to 7th 2015 in Enshi, Hubei Province. The food safety department of National Health and Family Planning Commission (NHFPC) Mr. Zhiqiang Zhang and vision deputy director Mrs. ..
As outbreaks of foodborne diseases caused by Norovirus have increased in recent years in China, CFSA held a workshop of detecting Norovirus in Xiamen City, Fujian Province from April 14th to 16th, 2015, hoping to help detecting technical personnel with new global advances in Norovirus detecting technology. 54 experts from CFSA and 31 pro..
Chinese Academy of Science and Science Foundation Ireland hosted a scientific cooperation seminar on December 9th, 2014 when Irish President Mr. Michael Higgins was visiting China. The seminar reviewed and showed collaboration outcomes between Chinese and Irish scientists in various areas. At the seminar, Mr. Higgins met with scientist representati.. In order to enhance China’s food safety risk assessment ability and laboratorial analysis ability, incorporate international advanced experience and accelerate the process of bringing up high-end professionals on food safety in China, CFSA and University of Maryland co-hosted the food safety laboratorial technology and management training program in the U.S. from June 4th to June 22nd in 2015. Twelve technical experts from CSFA attended this pr.. The Codex Committee on Contaminants in Foods (CCCF) held its 9th Session in New Delhi, India, from 16 to 20 March 2015, at the kind invitation of the Government of India. The Session was attended by 55 Member countries, 1 Member Organization, and Observers from 13 international organizations. Dr. Yongning Wu, Chief Scientist from China ..
Risk and Benefit Assessment of Potential Nurodevelopmental Effect Resulting from Fish Co.. Recently, a study on “Risk and Benefit Assessment of Potential Nurodevelopmental Effect Resulting from Consumption of Marine Fish from a Coastal Archipelago in China” was conducted by Key Lab of Food Safety Risk Assessment, CFSA, published in J Agric Food Chem 2014, 62(22): 5207-13.Fish can provide important nutrients to human body, including ..
Food safety is a top concerning in the world and a global public health challenge. For this reason, WHO set the theme of World Health Day as food safety this year. CFSA under the guidance of National Health and Family Planning Commission (NHFPC) and China Food and Drug Administration (CFDA) held the World Health Day Open Day on Ap..
CFSA Director General Mr. Jinfeng Liu Invited to Communicate Food Safety Risk Assessment..
CFSA director general Mr. Jinfeng Liu was invited to Yangtze Delta Region Institute of Tsinghua University to communicate food safety risk assessment and control with more than 50 district and county leaders as well as food safety managers in Leshan city, Sichuan Province on May 11th 2015.Mr. Jinfeng Liu made a further discussion with stu..
CFSA held a food safety law training program on May 21th, 2015. Dr. Dayuan Han, dean of Law School of Renmin University, was invited as a guest speaker to address on the concept and system of the newly revised Food Safety Law. CFSA director general Mr. Jinfeng Liu hosted the training program.The fourteenth session of the 12th Standi.. Choose Chicken Correctly and Pay More Attention to Sanitation / Food Hygiene help the Pr..
Pathogens are our enemies and among them are the Salmonella species. Salmonella causes 1.2 million illnesses in the United States, with 19,000 hospitalizations and 380 deaths every year and in China, it is estimated that over nine million people are infected and approximately 800 people die from Salmonella each year. Most people infecte..
Five Ministries including NHFPC (National Health and Family Planning Commission of the People’s Republic of China) have recently issued a joint announcement to change the regulations on the use of aluminum-containing food additives. Since July 1st 2014, sodium aluminium acid phosphate, sodium silicoaluminate and starch aluminium octenylsuccinate cannot..
Official Release of Risk Assessment of Dietary Trans Fatty Acids intake in Chinese Popul..
1. Background High intake of trans-fatty acids can increase the risks of cardiovascular disease and stroke. In 2010, several mainstream media focused on the health risks of trans fatty acids and suggested that “trans fatty acids are a time bomb on the table”, which caused a tremendous impact on the industry and public a..
2015 international forum on food safety was held by CFSA, International Union of Food Science and Technology (IUFoST) and Chinese Institute of Food Science and Technology (CIFST) from April 22nd to 23th in Beijing, focusing on constructing safety and healthy food industrial chain. More than 400 governmental officials, experts, scholars and m..
CFSA Broadens Channels of International Cooperation, Increases Modes of Communication an..
With the invitation from World Bank’s Global Food Safety Partnership Project (GFSP), Dr. Dawei Chen and Dr. Dan Wang from CSFA attended the training on new methods of drug residue detection at University of Maryland’s Joint Institute for Food Safety and Applied Nutrition (JIFSAN). This training was an important part of GFSP’s laboratory abi..
CFSA Signed MOU with French Agency for Food, Environmental and Occupational Health & Saf..
Director General Dr. Marc Mortureux from ANSES visited CFSA on Jan 30th 2015. CFSA director general Mr. Jinfeng Liu and deputy director general Mr. Xudong Zhang met with the ANSES delegation.Mr. Jinfeng Liu appreciated the support from France and expressed the significance of ANSES visit for promoting the cooperation of food safety and tech.. 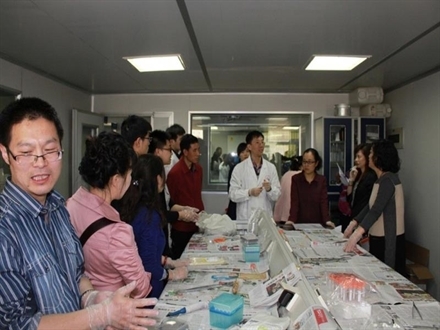 The “ecology – food safety- risk prevention and control” seminar was recently held in Beijing by CFSA, along with the environment department of Renmin University and UIB. More than 40 experts and managers from the ecology department of Chinese Research Academy of Environmental Sciences (CRAES), Harbin Medical University, Wuhan University, and N..
French deputy counselor of agricultural affairs o Mr. Charles Martins-Ferreira visited CFSA along with two other representatives. CFSA deputy director general Mr. Xudong Zhang swapped ideas with them on food safety standards and further cooperation plans. Mr. Xudong Zhang welcomed the visit of French representatives and introduced CFSA’s responsibili..
Food safety microbiological risk surveillance is a systematic activity which consistently collects data on foodborne pathogens including bacteria, parasites, viruses and other harmful agents. It also attempts to establish factors contributing to foodborne disease, timely detects food safety hazards and provides basic data for food safety monitoring, ri..